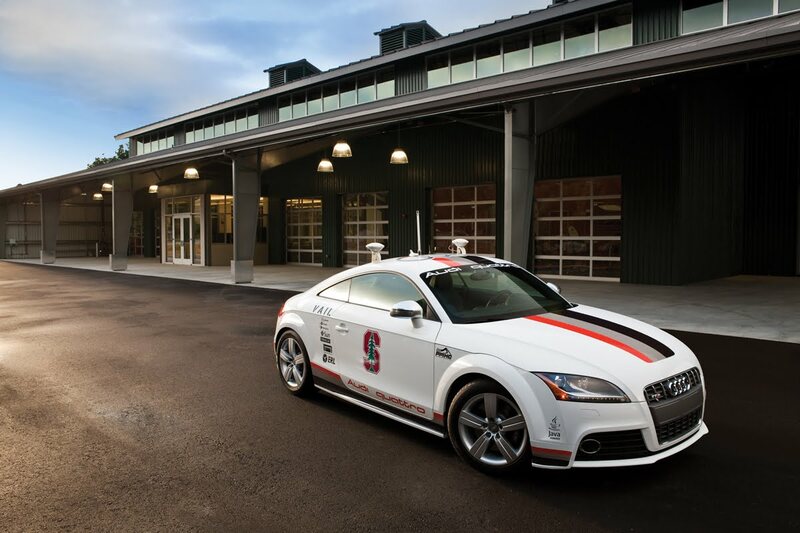 We first heard about this driverless Audi TTS created by Standford University and Audi last year. 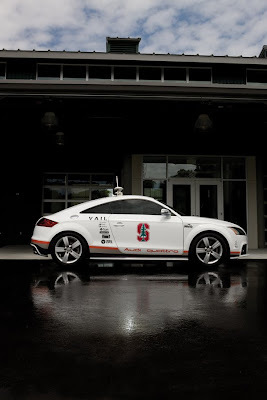 Nicknamed "Shelley" - in honor of famed Audi rally driver Michèle Mouton - the autonomous TTS is now gearing up for the ultimate challenge; tackling a Pikes Peak hill climb, without a driver. To look the part of a true Audi rally legend, Shelley is sporting a new look, a livery designed to honor not only the car's namesake but all previous Audi rally winners. Considering the volume of technical data associated with this subject, we have included the full details below, straight from Audi of America. The association between Pikes Peak and this research project relates to the original goal of developing advanced algorithms and actuation systems that would allow a car to complete a driving course without a human behind the wheel. 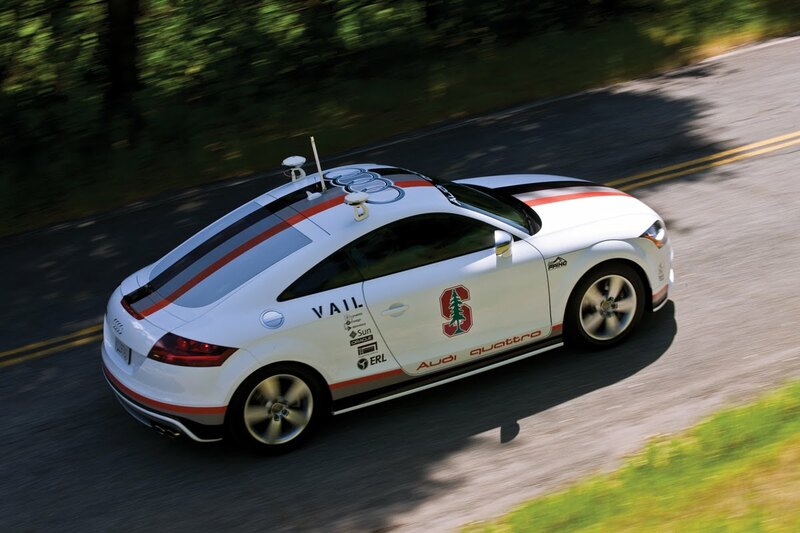 The partners in developing this technology – the Stanford University Dynamic Design Lab (DDL), the Electronics Research Lab (ERL) for the Volkswagen Group in Palo Alto, Calif., and Oracle Corp. – chose the part-pavement, part-gravel route of the storied Pikes Peak race to prove the project’s capabilities. The connection with rally racing provided another key inspiration to the project team. 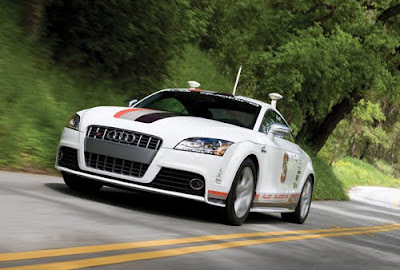 The Autonomous Audi TTS Pikes Peak is based on a street-ready Audi TTS sports car. 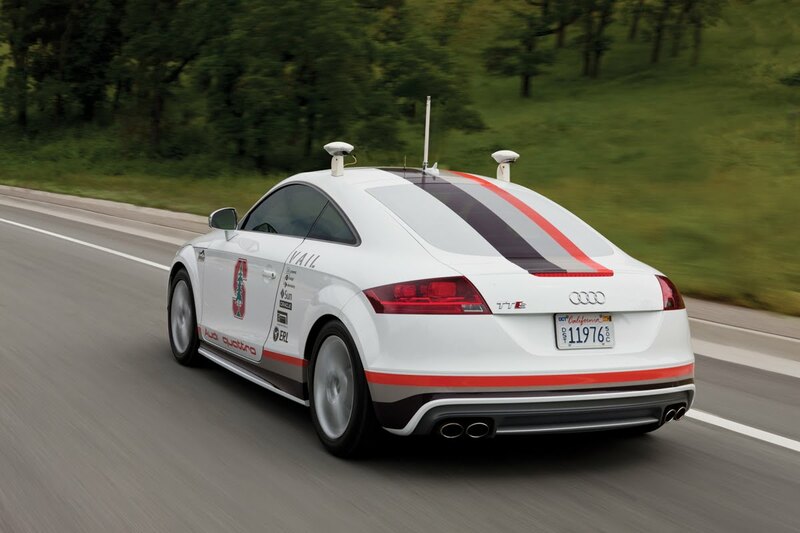 The team chose the TTS because its native systems, including a drive-by-wire throttle and a semiautomatic DSG gearbox were a good fit with the electronics that allow the car to drive without human input. The computing hardware added to the TTS research car isn’t significantly more elaborate than what can be found in a standard laptop. 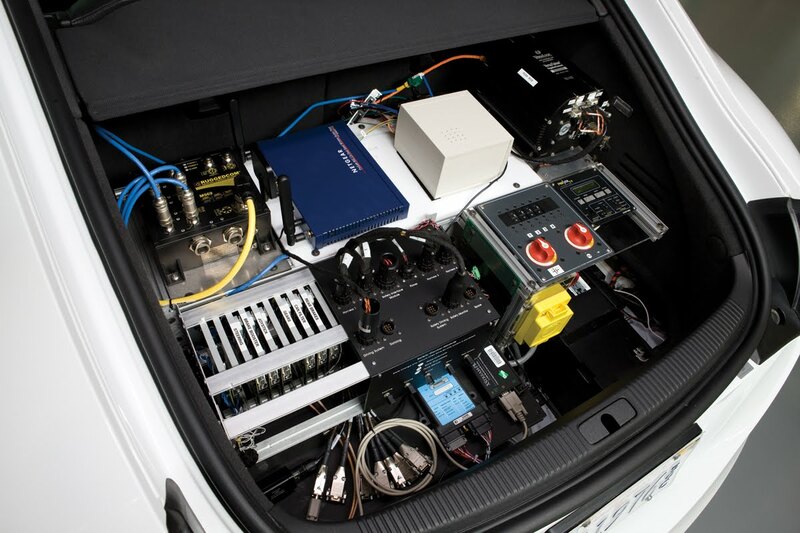 The car currently uses two computers in its trunk – one running safety critical algorithms using Oracle’s Real Time Java (Java RTS). The other runs vehicle dynamics algorithms. The two sets of algorithms are what enable the TTS to drive at the limits of handling on a variety of surfaces, speeds and conditions. The differential GPS system is capable of keeping the TTS within two centimeters of the center line of a normal course; researchers are planning on a one-meter margin on Pikes Peak due to the extreme conditions. The Autonomous Audi TTS Pikes Peak gained global recognition last year with a Web video that showcased the car’s ability to execute complex maneuvers on Utah’s Bonneville Salt Flats without a human behind the steering wheel. In the Pikes Peak Hill Climb, Audi legends were born a generation ago. Audi rally cars, such as the Audi Sport quattro S1 Pikes Peak, employed the all-wheel drive technology to win the 12.42-mile “Race to the Clouds” in convincing fashion. The drivers of those Audi quattro rally cars – Bobby Unser, Walter Roehrl and Michele Mouton – earned places in motorsports history at Pikes Peak. In fact, the researchers from Stanford and the Volkswagen Group’s Electronics Research Laboratory in Palo Alto, Calif., nicknamed the project “Shelley” after Mouton and her racing exploits. The Sport quattro S1 also inspired the “S” range of performance models, such as today’s critically acclaimed Audi S4 sedan. Tying the Audi traditions into a look for the Autonomous Audi TTS Pikes Peak became an engaging assignment for Audi designers at the company’s Design Center California in Santa Monica. Several options emerged, including an art car look that depicted the Pikes Peak route in a topographic map covering the body of the TTS. For the design that was selected, the goal was to pay homage to the past, while conveying the leading-edge technology that defines the TTS research car. Designers decided to give the rally car themes from the 1980s a forward-looking twist, said Sangyup Lee, Chief Designer (Group Exterior) at VW/Audi Group Studio California. The original rally cars, for example didn’t feature a large four rings logo on their roofs. But the designers used that design cue from modern Audi DTM racing cars in Europe so the brand image would be evident in aerial photos and videos. The highlight of the months ahead for the Autonomous Audi TTS Pikes Peak is the planned high-speed testing up Pikes Peak in the fall, weather conditions permitting. During testing the Pikes Peak course would be divided into segments, which the TTS research car would drive at progressively increasing speeds. Certification of the testing would be done by an independent motorsports organization. Later in the fall, also weather permitting, the Autonomous Audi TTS Pikes Peak plans to make a Guinness Book of World Records land speed attempt at the El Mirage Lake dry-lake bed in southern California or another nearby location. 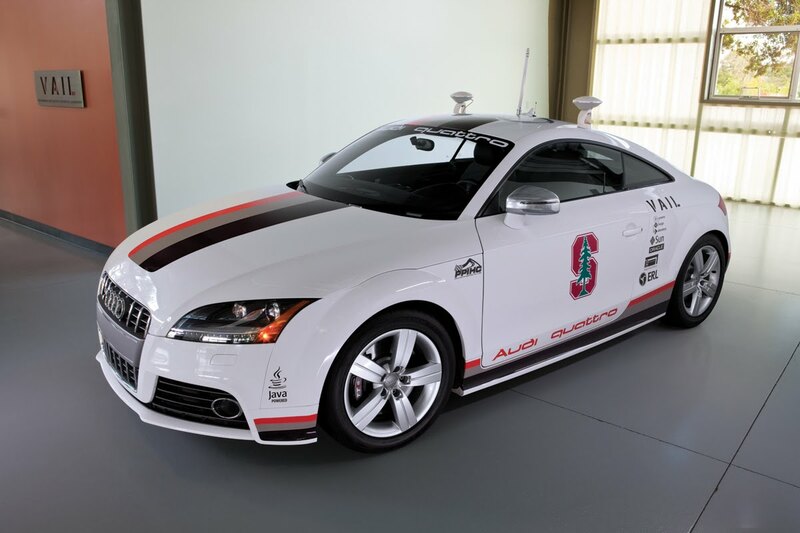 Officials from the Guinness Book would certify whether the TTS research car can establish a record in the new category of fastest speed in an autonomous vehicle.